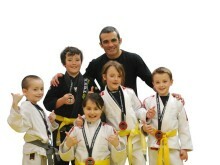 Yellow belt Harvey Innes (in white), champion of the boys 10-11 - 38kg division. 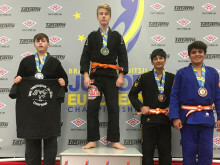 A teenager from East Sheen, Billy Hayes, has been named the top junior BJJ athlete in the UK by the UK Brazilian Jiu Jitsu Association (UKBJJA). 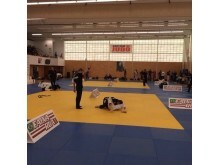 New English BJJ (Brazilian Jiu Jitsu) Champions were crowned last weekend at the English Open BJJ Championships held at Dartford Judo Centre on the 14th and 15th of November. 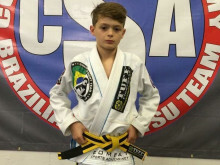 Basingstoke School of Martial Arts hosted the final Southern England Kids BJJ (Brazilian Jiu Jitsu) League event on Sunday 29 November, sponsored by BJJ fight-wear company Faixa Rua, at which the Southern England BJJ Champions were announced. 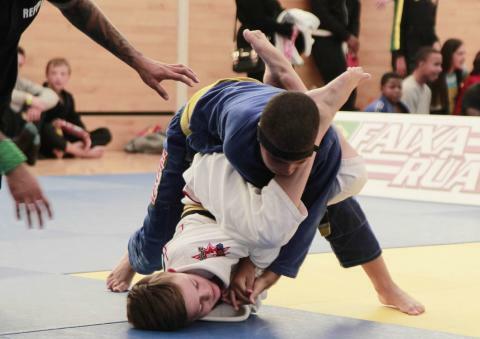 Dartford Judo Centre in Kent played host to the Junior and Juvenile English Open Brazilian Jiu Jitsu Championships at the weekend with more than 250 boys and girls competing for national titles. 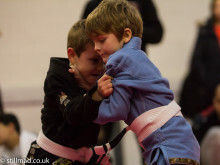 From January 2016, juniors and juvenile in the east of England will have the chance to compete regularly at friendly and well-organised BJJ tournaments as an Eastern England Kids BJJ League is announced. Entry fees will be low and affordable making the event regularly accessible to all families. The final ranking event of the year, the English Open Adults 2015, is taking place today at Dartford Judo Club with end of year standings to be decided. The final ranking tournament of the year, the English Open at Dartford Judo Club, in full swing. The English Open Juniors and Juveniles. The Essex Dojo, Unit 16 Eckersley Rd, Chelmsford, Essex, CM1 1SL.